Class 438 4-TC 8007 passes Newnham in the rain on 17 December 1991 with a Woking to Basingstoke high speed teat train. The train is being powered by 73205 at the rear of the train, although current is being picked up by experimental collection shoes fitted to converted Class 33115 (83301), which is coupled between the 73 and the train. The 33 is also fitted with Eurostar bogies. 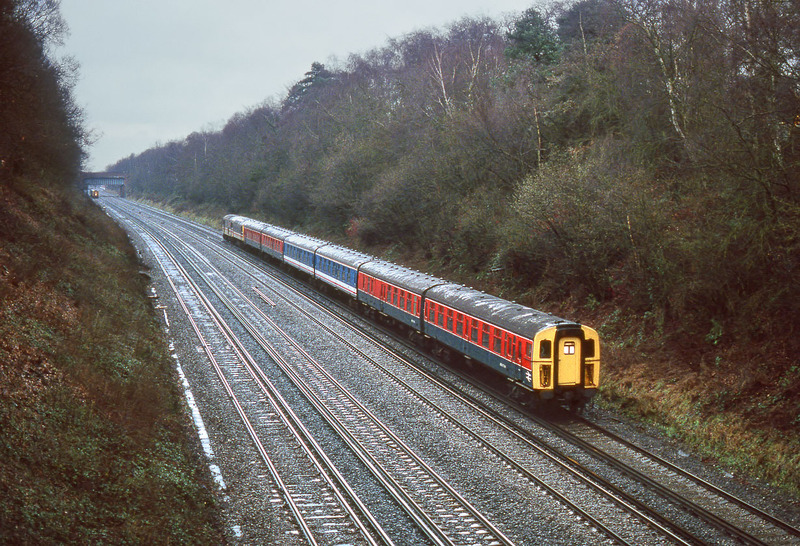 Initially the 4-TC set ran as a standard four car unit, but in March 1991 the two additional Network SouthEast liveried coaches were added, which, as the locos were in InterCity livery, made for a very colourful train! Apologies for the poor quality, but this is the only time I saw this extremely interesting train in action. The picture was taken on a very dull day on Kodachrome 200.